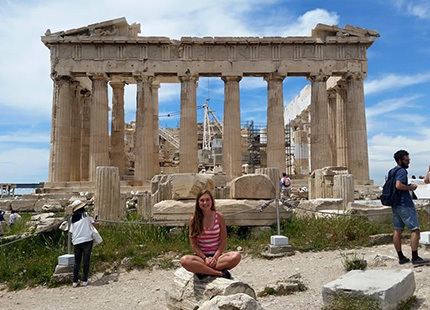 Athens offers students the opportunity to study in a city filled with archeological and historical sites. On this co-sponsored semester program, students will take center-based courses alongside other U.S.-based students. Some courses on this program include field experiences. Course Equivalencies: Please see the Athens-CYA course equivalency list for program enrollment requirements and a list of IU course equivalencies that students have received in the past. *Automatic $3,000 CYA discount applied to fee. Based on published CYA materials. Indiana University cannot guarantee the prices charged by CYA and is not responsible for any price increase or change. Airfare, personal expenses and vacation travel additional. Initial $500 prepayment due on April 1, 2019. Airfare, personal expenses and vacation travel additional. Initial $500 prepayment due on October 16, 2018. College Year in Athens Scholarships available. Applications should be submitted to Overseas Study.